A new task force is aiming to cut by 50 percent the number of women incarcerated in Illinois. The task force is made up of 100 women – including former inmates, corrections officials, judges and prosecutors. Notable among them are Illinois Supreme Court Justice Anne Burke and Cook County State’s Attorney Kim Foxx. 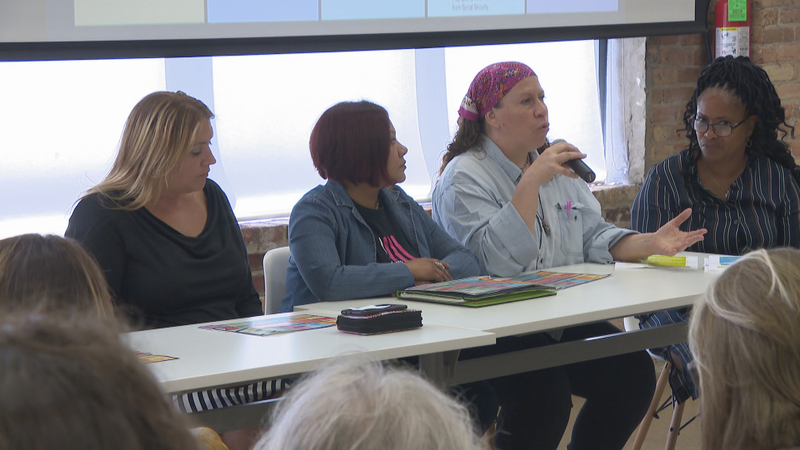 Leading the initiative is Deanne Benos, former assistant director at the Illinois Department of Corrections who is now the director of the Women’s Justice Institute, an organization she co-founded. But she says if the system is failing in general, for women the situation is especially bad. Members of a task force on Wednesday, July 18, 2018, announce a new initiative to reduce the number of women in Illinois prisons. While at the Department of Corrections, Benos says she was unable to successfully advocate for female prisoners but believes that now the stars have aligned to make real change possible. A study by the Women’s Justice Institute in 2016 identified serious problems at the Logan Correctional Center for female offenders. As a result of issues identified by that report, last year Gov. Bruce Rauner signed the Women’s Correctional Services Act which established new standards for women’s prisons in Illinois and mandated comprehensive gender responsive policies that included assistance for women dealing with trauma as well as more family centered policies. And so far, Benos said there has not really been much pushback. Benos joins Carol Marin to discuss the new task force and its goal of dramatically reducing the number of women in Illinois prisons.